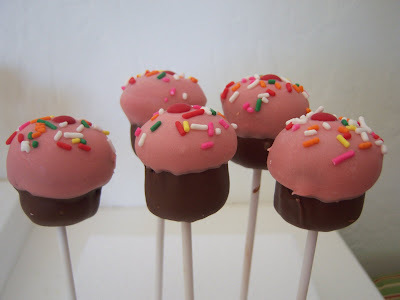 The end-of-the-year school picnic is tonight and the occasion called for CAKEPOPS! A collection of pops - some inspired by those at Bakerella, some I made up myself. These went much better than the apples - mostly because I used better ingredients (Black Magic Cake and DeDe Wilson's Fudge Frosting from A Field Guide to Cupcakes) and Wilton Candy Melts, which are not as fancy as the Valrhona white chocolate, but they're much easier to work with. Max asked how she can be called "Hello" Kitty when she doesn't even have a mouth? 4. Gently press into the plastic wrap with a film can or small spice bottle with a diameter smaller than the tablespoon to make an impression. 5. Remove the plastic wrap and pop out the molded Cakepop mush. Freeze for 15-20 minutes. 6. 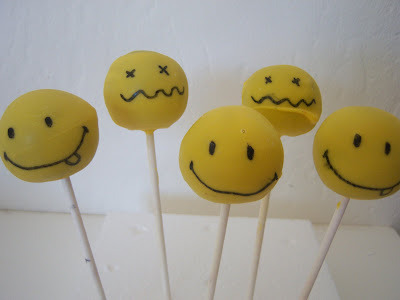 Put the stick in the pop and dip in colored Candy Melts just as for other Cakepops. 8. Decorate around the rim with Candy Melts - use a pastry bag with just a teeny snip or a #1 round tip. 9. 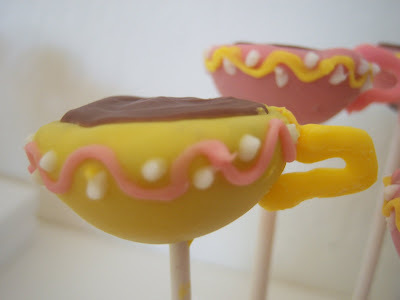 To make the handle, pipe a small "c" shape on waxed paper and let it set, attach to the cup with Candy Melt. Absolutely fabulously creative cupcakes - BRAVO!! Gorgeous! I could eat them all!! 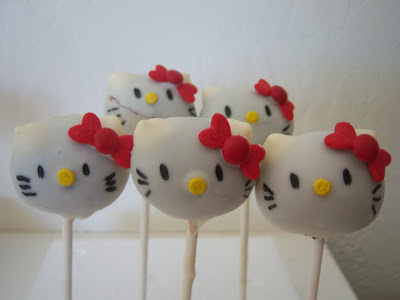 But the Hello Kitty are my favorite. Those are really cute! 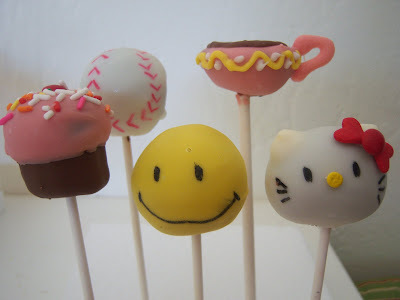 I like the Hello Kitty and teacup cakepops the best. Good job! I've really got to try these! 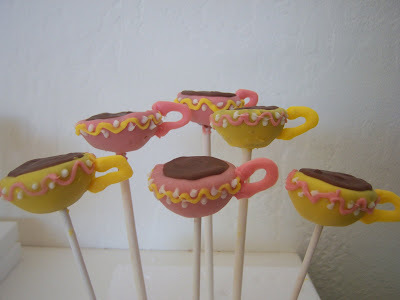 I've been subscribed to Bakerella's blog for a while now wondering if I could make these well. Yours look just as good as hers! Nice job! @ jengd - Yes you can! They take some time and prep, but are a lot of fun and people will think you're a goddess! 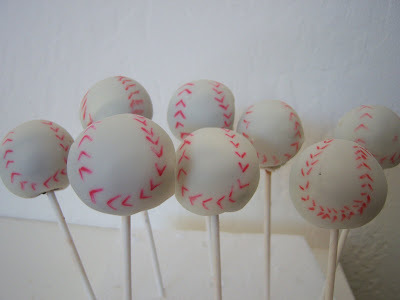 The baseball cakepops are my favorite!